During a 2001 training exercise with the Army National Guard, Craig sustained a traumatic brain injury and incomplete spinal cord injury when two Humvees collided where he was standing. Craig also copes with post traumatic stress disorder and dysautonomia along with a host of other injuries. 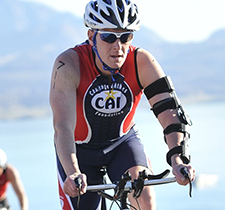 Paralyzed on the lower extremity and partially paralyzed on the upper left and right lower extremities, Craig found training for a triathlon could both strengthen his body and help reduce pain. Still an avid triathlete, Craig is now recognized as a CrossFit Level 1 Trainer and his ultimate goal is to participate in the 2016 Paralympic Games in Rio.